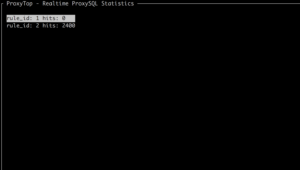 In this blog post, I’ll be looking at a new tool Proxytop for managing MySQL topologies using ProxySQL. 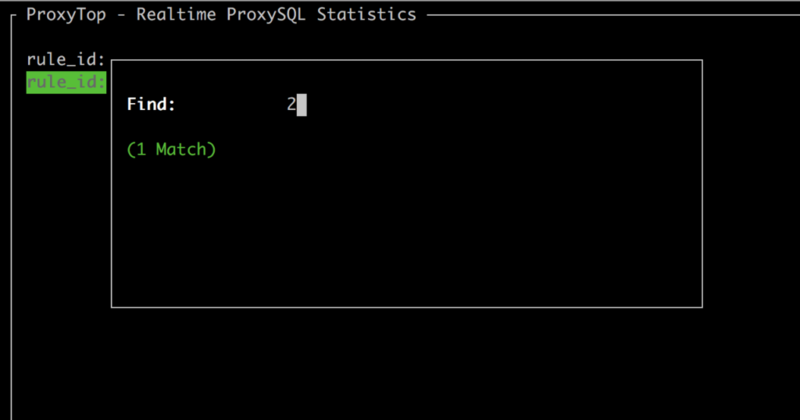 Proxytop is a self-contained, real-time monitoring tool for ProxySQL. As some of you already know ProxySQL is a popular open source, high performance and protocol-aware proxy server for MySQL and its forks (Percona and MariaDB). 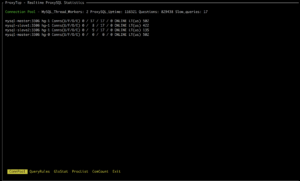 My lab uses MySQL and ProxySQL on Docker containers provided by Nick Vyzas. 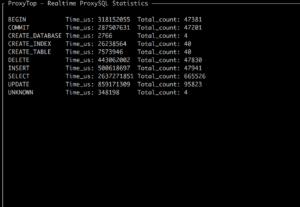 This lab also uses Alexey Kopytov’s Sysbench utility to perform benchmarking against ProxySQL. ## e.g. "sudo apt install python-dev libmysqlclient-dev"
[Fri Feb 16 10:19:58 BRST 2018] Dropping 'sysbench' schema if present and preparing test dataset:mysql: [Warning] Using a password on the command line interface can be insecure. Now let’s take a look at the Proxytop utility. It has menu driven style similarly to Innotop. Once you are in the tool, use [tab] to toggle between screens. Various shortcuts are also available to do things like changing sort order (‘s’), filter on specific criteria (‘l’) or changing the refresh interval for the view you are on (‘+’ / ‘-’). Current, y it supports viewing the following aspects of a ProxySQL instance. We’ll go each of these screens in detail. 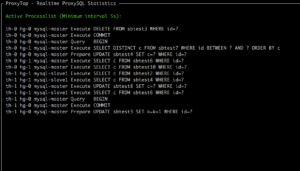 MySQL Server state in ProxySQL i.e. ONLINE / OFFLINE / etc. This screen shows query rules and their use by count, and can be sorted either by rule_id or hits (ascending or descending) by cycling through the ordering list by pressing “s”. 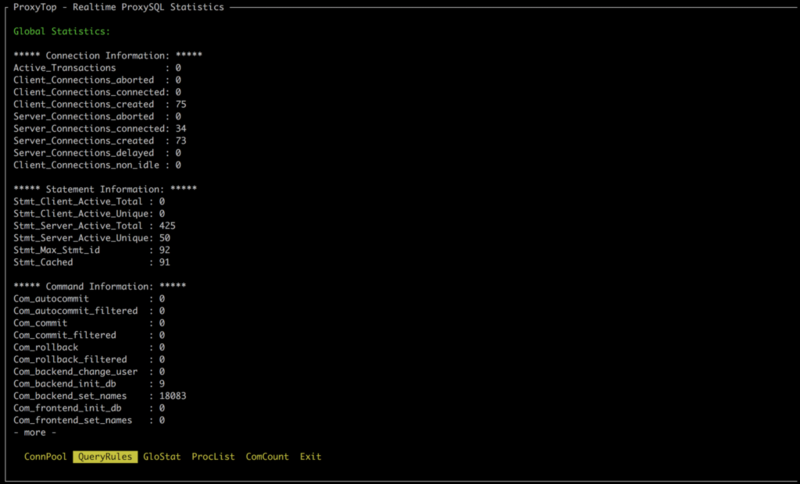 Global Statistics Screen: This screen shows Global Statistics from ProxySQL divided into four sections. We all know the power of command line utilities such as proxysql-admin. 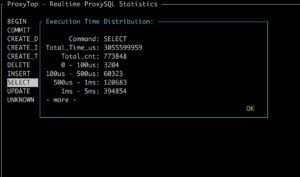 The proxysql-admin utility is designed to be part of the configuration and ad-hoc monitoring of ProxySQL that is explained here in this blog post. Proxytop is designed to be menu driven to repeat commands in intervals. You can easily monitor and administer ProxySQL from the command line, but sometimes running recursive commands and monitoring over a period of time is annoying. This tool helps with that situation.